When it comes to the importance of your home, hire a professional like Axium. If you are not completely satisfied at the end of the home inspection*, not only will we refund the home inspection fee, we will also pay for another certified home inspector of your choice to inspect the same house. 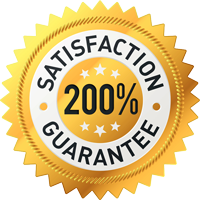 We are so confident in what we do, we are willing to back it up with our 200% Home Inspection Guarantee! Axium offers the BEST VALUE at the LOWEST PRICE, offering a 110% price match guarantee for any certified, bonded, and insured home inspector. We will match their price and beat it by 10%. Guaranteeing the lowest price and the best quality. Our home inspectors are nationally certified through InterNACHI or ASHI. We have 3 Board Certified Master Inspectors, and our inspectors are trained by a CMI with years of experience. Their backgrounds vary from licensed contractors to home builders. They will provide the best home inspection with their knowledge. Check Out All the FREE benefits of Choosing Axium Inspections! Your home is important. Don’t cut corners. Does it really make sense to cut corners and hire a less than qualified person to handle something as important as the safety of your family? Our certified inspections are very competitive and in-line with the most certified and insured inspectors across Colorado. We understand there are many costs attributed when buying a property, but with a property under contract, we know you want only the best for your new purchase. We base our pricing on type, size, and the age of the property. If you want to make sure you have a professional inspection, may it be a home inspection, radon, commercial, mold, wood-destroying organism, well, or water intrusion, we are the best at what we do. All of our inspectors undergo a thorough training program and are trained by a Board Certified Master Inspector. We offer the best certified inspections in the area, as well as superior customer service. We continually learn and grow from our clients and realtor partners and implement changes immediately when needed. You are our first priority, and we greatly appreciate your business. Please take the time to compare our qualifications and services, and you will see why Axium Inspections is the go to inspection company. We will match any competitor’s price as long as they are certified through ASHI or NACHI and insured and bonded as we are. We guarantee the best price and service!